Namibian companies need to examine quite a few reports on the economy to stay ahead of the game. 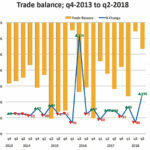 While we can look at GDP reports to identify how well a certain industry is doing, and how the country’s economy is evolving, there is another aspect to consider – trade. Like many companies, Trustco also peruses the Namibian Statistics Agency’s Trade Bulletin to not only use it as another useful barometer for the Namibian economy, but also to identify potential cross-border partners, and identify gaps in the market that we’re filling with imports. If we examine the latest bulletin, we find that during third quarter of 2018, Namibia’s exported N$ 24.3 billion worth of goods, while importing N$ 27.6 billion, leaving us with a total trade deficit of N$ 3.3 billion. As such, we’ve effectively exports locally created wealth abroad. This is an improvement from the third quarter of last year (N$ 8.3 billion) but a deterioration from the previous quarter (N$ 1.1 billion). Year-on-year, the improvement was due to strengthening exports, while the deterioration in the quarter was due to our import bill increasing. 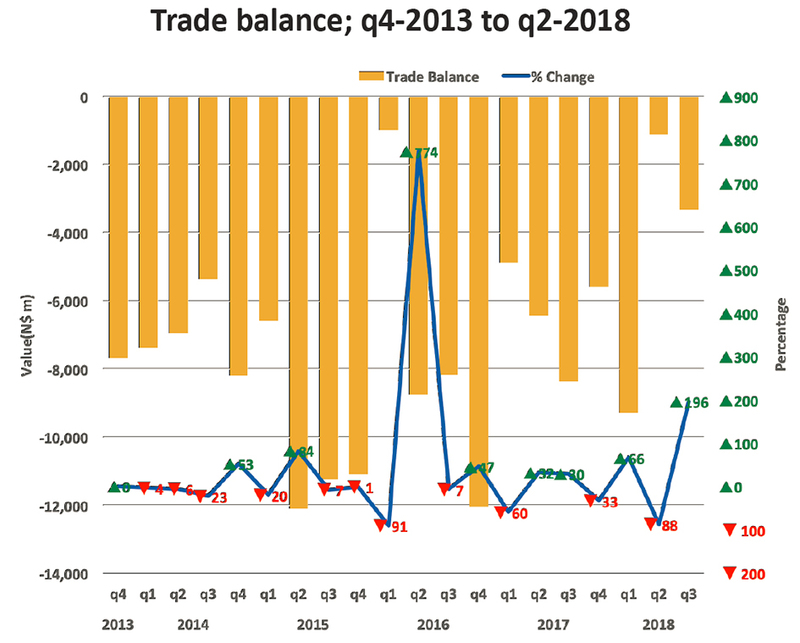 It thus remains worrying that Namibia now consistently has a trade deficit, instead of a trade surplus, every year since 2008. Let’s take a look at exports and imports individually. Namibia’s largest export market is again the Southern African Customs Union, with N$ 6.8 billion exported to that group of countries in this quarter, or 31% of our exports. In second place now is the BRIC (Brazil, Russia, India, China), with N$ 5.8 billion in exports (26%), having increased 404% year-on-year and 77% quarter-to-quarter. The European Union with N$ 5.6 billion in exports (14%) dropped to third place, due to copper cathode exports dropping 48%. The non-SACU SADC with N$ 1.9 billion (9%) is fourth in exports, and finally, the Common Market for Eastern and Southern Africa (COMESA) contributed N$ 1.6 billion (8%) in exports. When we take a look at the individual countries we export to, China took the lead with N$ 5.5 billion exported, or 23% of our exports, with South Africa second at N$ 4.1 billion (17%), Botswana another N$ 2.7 billion (11%), the Marshall Islands with N$ 2.2 billion (9%) and Belgium with N$ 2.2 billion (9%). Together, these 5 account for 69% of our exports. However, 70% of our exports were from only 4 categories – Copper cathodes (N$ 5.9 billion), Diamonds, jewellery and precious metals (N$ 5.7 billion), Ores (N$ 2.8 billion), and Fish (N$ 2.5 billion). The increase in copper coincided with higher foreign demand from China, Zambia and Belgium, while diamonds were more in demand in South Africa, Belgium and Botswana. Ores saw an increase in exports also to China, but France contributed as well. Fishing remains a vital source of revenue for the economy, with fishing exports having grown at an average of 5% over the last 20 quarters. A notable outlier in the exports is a once-off shipment of a vessel to the Marshall Islands, our only export to there. However, since this was a re-export, it is noted in the imports as well. Notably, 49% of our imports came from just 5 categories – Copper cathodes (N$ 4 billion), Mineral fuels & oils (N$ 3.4 billion), vehicles (N$ 2.1 billion), boilers (N$ 1.9 billion) and ores (N$ 1.8 billion). Copper cathodes are imported from Zambia for smelting and export, as can be seen in the export statistics. Mineral fuels are imported from South Africa and the middle-east. Vehicle imports are mainly sourced from South Africa with a bit from China, which matches the boiler imports as well. Ore is imported from Peru and Bulgaria for smelting at Tsumeb before its exported again. Trustco’s mining operations and diamond polishing factory is set to start contributing to the diamond exports of Namibia, but the other factors also reveal some weaknesses in the Namibian economy, as well as opportunities. Namibia is increasingly being used as an ore processing site, but there remains scope for manufacturing in Namibia, especially around vehicles and boilers. The increase in imports could be an indication of a turnaround in the Namibian economy, but trade is only part of the picture. We need to start developing our own manufacturing industries, so we can export more to cover our imports, as our continued trade deficit exports Namibian wealth yearly.